Tent rental Ballast, Anchors and Weights guidelines. This page is only intended as a visual explanation for customers renting tents from Big Ten Rentals Inc and installed by our professional crews. 55 Gallon Water Barrel for ballast/tent anchoring. The Tent Rental Division of the Industrial Fabrics Association International announces the release of the guidelines and online tool for ballasting of commercial tents. This calculator was derived based on a study completed with Clemson University Department of Engineering in Clemson, South Carolina. The guidelines and online tool level the playing field of tent rental companies by providing tested and proven industry guidelines for safe ballasting of tents in a user-friendly format. They help tent rental companies determine best methodology for using ballast units to anchor frame tents and clear span structures and determine the expected mean coefficient of friction for water barrels, concrete barrels and concrete blocks on dry asphalt, wet asphalt, dry smooth concrete, wet smooth concrete, dry rough concrete, wet rough concrete, grass, dirt and gravel. The source of the recommended weight to be applied on a given leg of a tent is provided by the tent manufacturer. Guidelines will provide recommendations as to how a tent rental company can reach the given amount of ballast and what the “weight” of the ballast is under various conditions. The ballasting tool allows a rental company to select from a drop down menu surface type, ballast type, surface condition and modifier. Companies enter the recommended load from the tent manufacturer, ballast distance from upright and the diameter/size of the ballast. The ballasting tool formula calculates the required amount of ballast and includes the modifier information. Testing resulted in a set of complex formulas that contained multiple failure modes per configuration. The committee worked tirelessly with Clemson University to convert these formulas into a simple and easy tool for the membership. To access guidelines and ballasting tool see the “members only” section of the TRD website. TRD membership is required to access this portion of the site. The Tent Rental Division of IFAI is an industry alliance of companies in the commercial tent manufacturing and events business. To become a member of the Tent Rental Division, visit themembership form. TRD’s parent organization, the Industrial Fabrics Association International (IFAI), is comprised ofmember companies representing the international specialty fabrics marketplace. Members’ products cover the broad spectrum of specialty fabrics and include fibers, fabrics, end products, equipment and hardware. IFAI is the largest, most comprehensive trade association serving this industry. 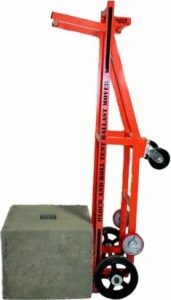 Rent our Block and Roll mover for tent ballast by (Block & Roll). Concrete is the preferred “Dead Weight” method to anchoring tents when stakes are not an option.